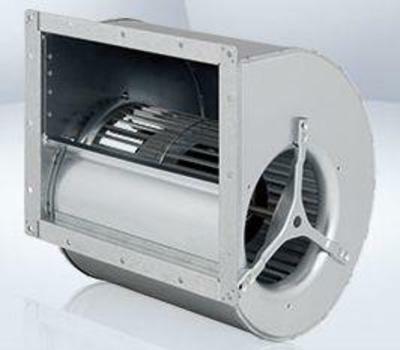 Centrifugal fan for AC motors. The EBM-PAPST company was founded in 1963 and to date is the leading world producer of fans and motors, the legislator in the field of high-efficient EC technology. The company produces 49,8 million motors and fans in a year and has an assortment of products more than 15000 items. Ebm-papst manufactures its products in 17 production sites (in Germany, China, the USA etc), and also has 57 departments of sales all over the world, and about 10,000 employees. Wares of world leader at the market of vent equipment it is possible to find in many areas, for example in the ventilation and cooling technology, household appliances, heating equipment, IT and telecommunication equipment, passenger cars and commercial vehicles. Basic credo of company is that every new developed product must excel the predecessor on an economy and ecofriendlyness". Materials, production and technologies are developed with the latest environmentally friendly techniques. Centrifugal fans with forward-curved blades. Compact and noiseless. Can be with single-inlet or dual-inlet. Centrifugal fans with backward-curved blades. The do not need for a scroll housing. They are perfect for control cabinets, medical equipment, power computers, for mechanical engineering and ventilation of apartments. Axial fans. They are compact and effective. They are ideal for exact control of temperature and moving of air; for cooling of electronics and motor industry and for thousands of other applications. Tangential Fans. They are perfect for use in stoves or heating appliances and also in multimedia projectors or tanning salons. Motors and drive systems. Can be with an external and internal rotor, with power from 1 to 1,500 W. They are reliable, lasting and clever. Circulation blowers for hot air. They are intended not only for flags and ovens but also for the chambers of climatic tests, medical devices or dryings stoves. Pumps. Presented by circulation pumps and dosing pumps for drying linen, conditioners, refrigerators, coolers of drinks or dish-washings machines. Heating technology. It includes a large range of equipment for use in gas boilers, fuel elements, and also in many other spheres.